Today Nick Timothy defended Theresa May’s “hostile environment” immigration strategy amidst the Windrush crisis that has seen British citizens threatened with deportation. 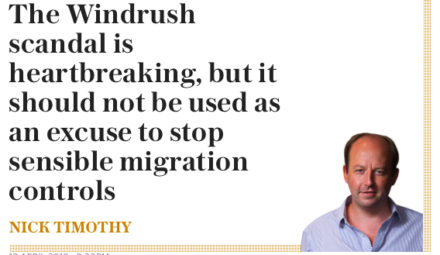 In his latest column for the Telegraph, the man often held chiefly responsible for the Tories’ disastrous 2017 manifesto argues that the Windrush scandal should not lead to a change of direction in wider immigration policy. Timothy served as Theresa May’s joint chief of staff until his resignation in the wake of last year’s general election. The political adviser says Tory ministers are right to make it more difficult for illegal immigrants to rent, gain employment and benefits. He does admit, however, that “things must not go too far”. Timothy goes on to reveal that although Theresa May has been criticised for the notorious “go home” immigration vans sent to six London boroughs in 2013, the plan was in fact approved “while she was on holiday”. The tweet posted by Nick Timothy, promoting his column and highlighting his ‘scoop’, offers a fantastic example of Twitter’s unofficial law, The Ratio, with 750 replies and 71 retweets. Whitehall literally takes *years* to sign off ad campaigns (Those Who Can, Teach for instance took c18 months). Yet somehow the Home Office hired a van, a poster company all while May was hiking somewhere. Impressive. Waiting for Nick Timothy to claim Theresa May wasn’t responsible for the decision to call the snap general election because it was made while she was on holiday in Wales. The Go Home van had a number to text – and the Home Office received 1,561 messages. Unfortunately, 1,034 were hoaxes which took 17 hours of staff time to deal with. Following Nick Timothy’s column about Theresa May and the “go home” vans, I just want to make it clear that all the bad articles I’ve ever written, I was opposed to them, and they happened when I was on holiday anyway.